For those of you who are regular readers, this blog post was written by Jeff Allison of Allison Customs, who is our newest contributor, owns the shop that is building my Chevelle, and is a close personal friend. We’re trying something new here at The MuscleCar Place by adding in contributors that are working hard to make the world of muscle cars a better place, and are chasing their dreams while doing it. Look for more great stuff here from Jeff in the future! Jeff Allison and son. 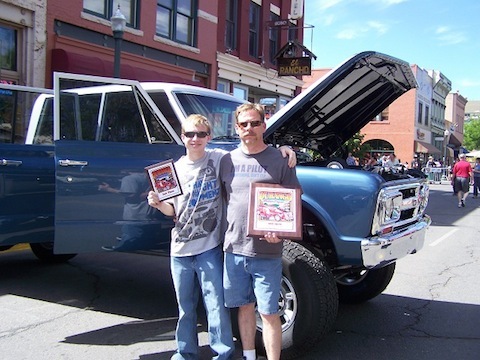 Jeff is the owner of Allison Customs and will be a regular contributor here at The MuscleCar Place! I’M A CAR GUY! Probably not a shock to anyone reading this, as it’s a blog written for an audience of car lovers posted on a website for men and women with a passion for the automobile. I’m new to this whole blogging idea; so, when asked to contribute a semi-regular blog for the Muscle Car Place, I thought it should begin as any polite meeting would; with an introduction. And those four words say a lot about me. My love of cars began, typically, in my adolescence as I approached the age when I would be allowed a driver’s license. When I was 14 and a half, I made a deal with my dad that whatever I could manage to save towards a car, he would match. I worked every odd job I could find and saved up $300.00 which my father, true to his word, matched penny for penny. I took that $600.00 and bought myself a Canary Yellow 1974 Toyota Corona. On my 15th birthday, my dad drove me to the DMV in that yellow Corona to get my driver’s license. I had a license and a car! What could be better! Actually … there were things that could be better, so I saved again and bought a set of chrome and black modular wheels and the widest rear tires I could find. My mistake was in not consulting my father first. He wasn’t pleased with my modifications, reminding me that he owned half the car, and he threatened to make me put the original tires and wheels back on his half. According to him, I was free to do whatever I liked with my half. Thankfully, he never carried out his threat and I soon decided I was much too cool to drive a yellow car. Having learned my lesson, I asked my dad if I could have the car painted. “Sure” he said, as long as I paid for it. I’m sure he thought it was safe to give me permission because I would never be able to afford it. However, I found a guy who agreed to paint it with Jet Black lacquer paint for $300.00. After that, my dad realized he couldn’t win; that I would never be happy with simply having a functional car to drive. I needed to make that car mine! In the years since, I’ve owned dozens of cars and trucks. I’ve never been able to resist making changes to them whether it meant adding, removing, modifying or upgrading; I have to put my personal stamp on each one. The only exception is whatever car my wife drives. She will not allow me to touch hers. I now operate my own car customizing shop, Allison Customs and my current project is a ground up rebuild of Robert Kibbe’s 1964 Chevelle. In future blog posts I will update you on this and other projects that I have going.